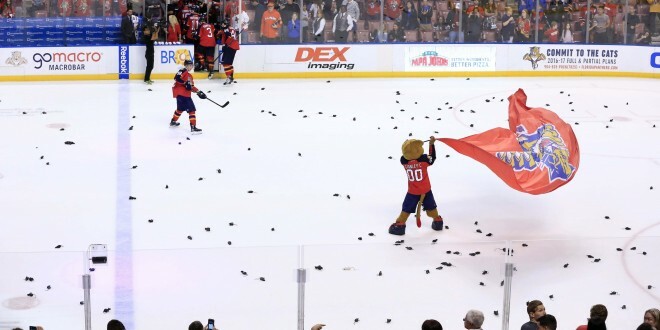 The Florida Panthers and Tampa Bay Lightning were both in action last night, as the Panthers took down the New Jersey Devils, 3-2, and the Lightning fell to the Montreal Canadiens, 3-0. The Panthers gave up the first goal, as Mike Sislo scored on the power play notching just his third goal on the season with 11:30 left in the first period. The Cats wouldn’t let it stay that way for long as Jonathan Huberdeau deked right then left, before initially putting the puck into Keith Kincaid’s pad, and eventually scoring on the rebound. Huberdeau’s second goal of the game would put the Panthers up 2-1 with 16:47 left in the third period. Huberdeau’s nasty short side snipe found the net by mere inches as Kincaid dropped down to the butterfly trying to make the save. Florida’s next goal came from Aleksander Barkov with 2:08 left in the contest. Jaromir Jagr, who currently sits at number two in the NHL’s all-time points list, led the two-on-one breakaway, finding Barkov in the crease for the one-timer to put the Panthers up 3-1. New Jersey’s Blake Pietila would score with six seconds left, but it wouldn’t be enough. Jonathan Huberdeau was rated the game’s first star with two goals, while Florida goalie Al Montoya earned the second star with 23 saves on 25 shots and Jaromir Jagr took the game’s third star with two total assists. The Panthers’ next game comes on Saturday night, as the Cats take on Montreal at 7 P.M. at the BB&T Center in Sunrise. 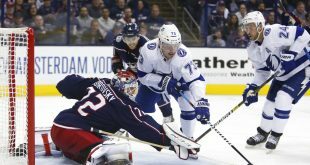 The Tampa Bay Lightning didn’t have the same success last night as the Panthers did, getting shutout by the Montreal Canadiens, 3-0. Montreal’s rookie goalie Mike Condon earned the first shutout of his career. David Desharnais got Montreal on the board first, as he put Sven Andrighetto’s shot in the back of the net off of a rebound in the high slot. The goal was Desharnais’ 10th of the season, as the Habs went up 1-0 with 10:49 left in the first period. Torrey Mitchell notched the game’s second goal, as he swooped around Lightning defenseman Andrej Sustr, before flicking a quick snap past the glove of Ben Bishop with 19:08 left in the second period to put the Canadiens up 2-0. Phillip Danault scored the game’s final goal with 2:48 left to go in the contest on an empty netter after Torey Mitchell’s 3/4 ice shot went just wide. The Lightning are now just 1-3 in their last four games. PLAYOFF PICTURE: The Lightning and Panthers both have five games remaining, but Florida has a two-point lead in the Atlantic Division as the Cats chase their first division title since the 2011-2012 season, which was also the last time they made the playoffs. The Panthers’ remaining games are versus three teams that have been eliminated from the playoffs in Ottawa, Toronto and Montreal (2), while the Lightning’s remaining games feature three teams still in playoff contention in the New Jersey Devils (2), the New York Rangers and the New York Islanders. Tampa Bay’s only remaining game verse a non-playoff contending team comes in their last game of the season against Montreal. If the season were to end today, the Panthers would finish as the #2 seed and face off against the #7 New York Islanders, while Tampa Bay would finish as the #4 seed and take on the #5 Boston Bruins.